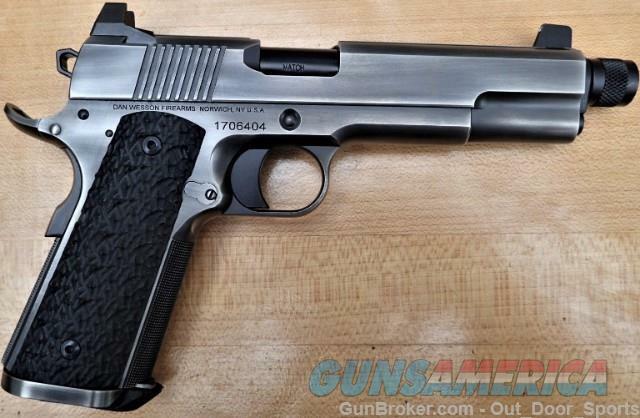 Dan Wesson uses the best components and finishes the industry has to offer creating the best possible 1911. The 1911 Wraith is a threaded Grovernment-size 1911 constructed of forged stainless with stippled G10 grips that are cut short to accommodate a magwell. The slide wears an abbreviated set of forward serrations and a set of high night sights. This model has a threaded 5.7" barrel chambered in 10mm, a distressed duty finish, and a 9-round capacity. -Barrel Length Range 5.00" to 5.99"
We figure "EZ PAY" by dividing the cost of the firearm, shipping and the 3.5% credit card fee into monthly payments and rounding up to the nearest dollar. Our financing is subject to these terms and not upon mathematical errors or omissions in our ads. *EZ PAY is for Credit Cards or Debit Cards. * We will send you a secured link to make all your payments. *Using our payment link, additional payments of any amount can be paid at any time. *You will be e-mailed a receipt by our bank * Keep your own records or refer to your cc statement. There is a $10 charge for looking up balances. *Payments are due every 30 days from the auction closing. *If a payment is more than 30 days late, the firearm will be re-listed, and you will lose all payments made. *Payments are non-refundable. BUYERS NOT USING "EZ PAY"
Our auctions are based on cash sales. If you would like to use a credit card, there is a 3.5% credit card fee. WARRANTY INFORMATION: All guns are warranted by their respective manufacturers. RETURNS: This is a 3 day no-fire inspection period. Void if the firearm leaves the dealer’s premises or is transferred into the buyer’s name. In the event of a return, the buyer In the event of a return, the buyer pays return shipping, $35 restocking fee, and commission and relisting fees.